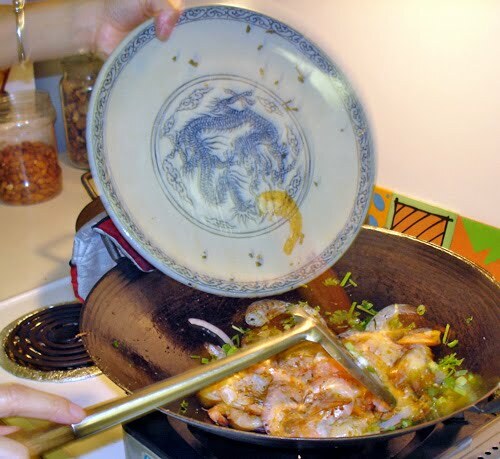 Crispy Salt Shrimp is a finger lickin’ dish that’s so delicious even grown men like my husband doesn’t mind peeling the shells! Making this dish always reminds us of several funny stories with the tea finger dip (story below.) To me, food is all about shared memories, experiences and associations and this dish definitely represents all three! Chop all aromatics and leave on your chopping board. Dry shrimp VERY WELL with paper towels. The secret to making this shrimp crispy is to have patience. A word that makes busy people cringe, so don’t make this when you’re starving after a long, hard day at work. Leave it for a weekend when you have a little more time. Fry shrimp in TWO batches. Spread them out. When I researched recipes online or on Youtube (some very annoying videos) for Salty Shrimp, nearly all of them were coated with flour and deep fried. Not me, I hate wasting all that oil. You could reuse but why would you want to? It’ll be ‘shrimpy’. Whenever I tackle a dish, I like figuring out how to make the dish healthy, yet tasty and the easiest possible method. It’s what being a Wok Star is all about. As regular readers know, I don’t use recipes so here are very rough guidelines (I made this a while back and found it in my huge library of meals.) The more you cook without measuring, the better you’ll get at judging how much you’ll need to ‘season’ your food. So, here’s my simplifed version with very few ingredients and tastes so good! Make hot tea and put into bowl with wide opening, one bowl per person. Cut a lime or lemon into wedges and add to bowl of tea. You can use this ‘natural astringent’ dip to rinse your fingers after shelling your shrimp. 1. Defrost shrimp under running cold water. Dry VERY WELL with paper towels. 2. Chop all aromatics and leave on your chopping board. 3. 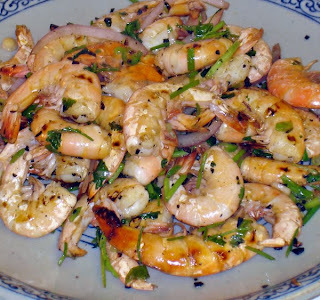 Very important – fry shrimp in TWO batches. Heat your cast iron wok or skillet on high (see notes below.) Add 3 swirls of oil. Immediately add a third of the garlic and ginger. 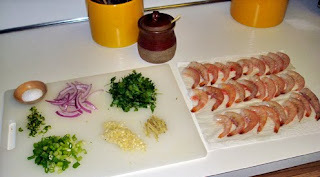 Immediately add in half of the shrimp and spread them out so they all get some heat and not overlap each other. This is what will give your shrimp a crispy exterior and succulent interior. To test the shrimp for doneness, check the one at the base of your wok (the hottest area.) Once the shrimp turns pink on one side, you can stir fry the whole batch by constantly flipping them over. It doesn’t take long for all the shrimp to turn pink. Don’t overcook shrimp or seafood esp. calamari because it becomes chewy and tough instead of tender. Add a few tsp. of rock salt to shrimp. Remove the shrimp to a platter. Do NOT cover because it makes the shrimp stew in its shell and go soft. Cook second batch the same way. 4. 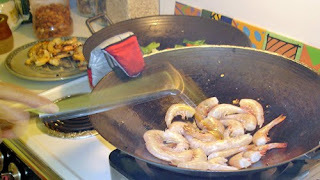 Add a little oil into wok to cook your aromatics. Add garlic and ginger first, then rest of aromatics and serrano chilies last because they are so pungent, they make you gag. Add all the shrimp back in with the aromatics and fry to coat. Give a shrimp a taste and add more salt if you need to and you’re done! Put another dish out for the shells. O.K. here’s the funny story: My mom was visiting us in Key West and it was her first meal with Ralph (yeah, before we got married). I set down the finger dipping bowls and next thing I knew, mom started nudging me, “quick, he’s going to drink it, he thinks it’s soup!” I’m laughing from the memory of it, my mom immediately liked him, she thought he was a hoot. Well, also because she discovered he was a ‘Chinaman’ in his previous life, Ralph likes hot food piping hot, not luke warm and he’d eat Asian food everyday rather than Western food. To give your shrimp that seared look and to get them crispy, you need high heat. 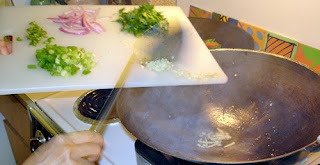 Non-stick woks or pans are not supposed to be used above medium heat. 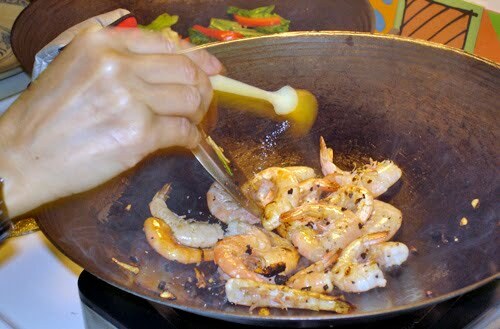 When you crowd your wok or pan, it lowers the temperature of your pan and then juices will exude which in turn stews your shrimp instead of giving it a crispy, crunchy exterior. So, fry in TWO BATCHES, you won’t regret it. Link to check out different types of chili peppers. I like frying with canola oil and have been using it for a number of years but currently trying some Tea seed oil from China, not tried enough to tell yet. Here’s a chart to show different oil smoke points. 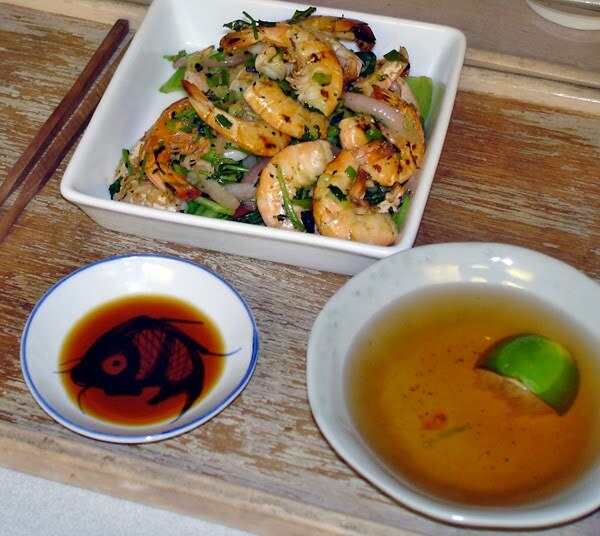 Sesame oil is not good for stir frying because it does smoke and it’s very overpowering but good for marinading, adding to pasta, making sauces and salad dressing. I don’t know why I can’t join it. Is there anybody getting identical RSS issues?